The following is a list of free data sources that can be used for predictive modeling, machine learning and text mining projects. It contains many datasets that can be used for solving regression and classification problem statements. It is maintained by toronto university. It contains data and R code for a book named "R and Data Mining". It is the best place to discover and analyze public available data. It is a repository of hundreds of public available datasets. It is one of the biggest repository of public data sets that can be used for regression, classification and machine learning projects. It provides a centralized repository of public data sets at free of cost for the analytics community. It is a repository of many useful big datasets that can be used for practicing any data science and machine learning technique. For example, there is a dataset that identifies 38M tweets collected for the analysis of social media messages related to the 2012 U.S. Presidential election. Yahoo has released the largest ever machine learning dataset for researchers and engineers. It is a database of IMDB files which can be used for text mining and other data science projects. It is a R package containing datasets mentioned in book "Applied Predictive Modeling" written by developer of one of the most popular R package 'caret'. It is a repository of machine learning data. It contains hundreds of datasets for various streams. It is the sample dataset that accompanies Doing Data Science by Cathy O'Neil and Rachel Schutt. It is a repository of sample datasets used in Revolution R (now Microsoft R). 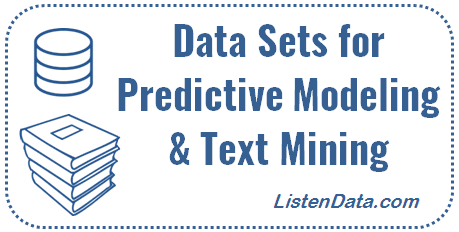 5 Responses to "Free Data Sources for Predictive Modeling and Text Mining"
I am recommending Listen Data as a clear leader in Data Science content. This list especially is well curated. I am impressed with your information.